^ 3.0 3.1 3.2 《世界人权宣言》问世经过. 《美国参考》（美国国务院国际信息局主办）. [2012-11-23]. ^ 7.0 7.1 7.2 7.3 背景. 《經濟，社會，文化權利國際公約，公民權利和政治權利國際公約》. 香港政府印務局. 1995. ^ See "Who are the signatories of the Declaration?" in Questions and answers about the Universal Declaration of Human Rights 互联网档案馆的存檔，存档日期2012-09-12., United Nations Association in Canada. ^ Schabas, William. Canada and the Adoption of Universal Declaration of Human Rights (fee required). McGill Law Journal. 1998, 43: 403. ^ 布朗（Gordon Brown）. 世界人權宣言70周年 宣言仍只是宣言. 上報. 2018-12-30 [2018-12-30]. ^ UDHR film. Amnesty International. [2013-07-19]. （原始内容存档于2013-08-01）. ^ Fire Up!. Amnesty International. [2013-07-19]. （原始内容存档于2013-08-01）. ^ Article #1, We Are All Born Free and Equal. Youth For Human Rights Video. [2013-07-19]. ^ Human Rights Message Reaches 130,000 Viewers. Church of Scientology International. [2013-07-19]. ^ United for Human Rights Multimedia Educational Materials. Church of Scientology International. [2013-07-19]. ^ ALAIN JOURDAN. L’ONU a mis en échec la tentative d’infiltration des scientologues. Tribune de Genève. 2009-08-28 [2013-07-19]. （原始内容存档于2014-04-08）. ^ Rosie Squires. Scientology targets young kids. The Sunday Telegraph. 2009-11-22 [2013-07-19]. ^ Sean Rubinsztein-Dunlop. Scientologists 'targeting' schoolchildren. ABC News. 2009-11-13 [2013-07-19]. ^ Daniel Piotrowski. This high school seminar brought to you by Scientology. News.com.au. 2013-02-21 [2013-07-19]. Glendon, Mary Ann. 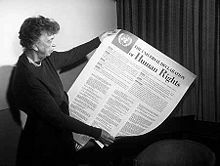 A world made new: Eleanor Roosevelt and the Universal Declaration of Human Rights. Random House. 2002. ISBN 978-0-375-76046-4. Morsink, Johannes. The Universal Declaration of Human Rights: origins, drafting, and intent. 宾夕法尼亚大学出版社. 1999. ISBN 978-0-8122-1747-6.